TOTALLY scientific. 🙂 Here’s to all of the BFF’s out there! Usually, it’s all a lie, though. Some of us, on particularly horrible days, will answer with a, “OK,” or, “It’s going.” And that’s as deep as it gets. Once, when I waitressed at Red Lobster as a teenager, I asked a customer how he was doing. He sincerely answered my question, detailing the events of his debt, his sense of aging, his last birthday. The level of confusion I felt as he prolonged the required, 1-sentence answer? Unparalleled. But I think about that still. What if we really wanted to know the answer to the question, “How are you doing?” What could we say? It’s such a broad, general question. Maybe part of it is, also, just asking a better question. Here are 10 questions I often use with some of the toughest-to-crack people I know: teenagers. These are questions I also ask of adults. They throw people off their game a little. They evoke a laugh, a double-take. They often spark sincerity. 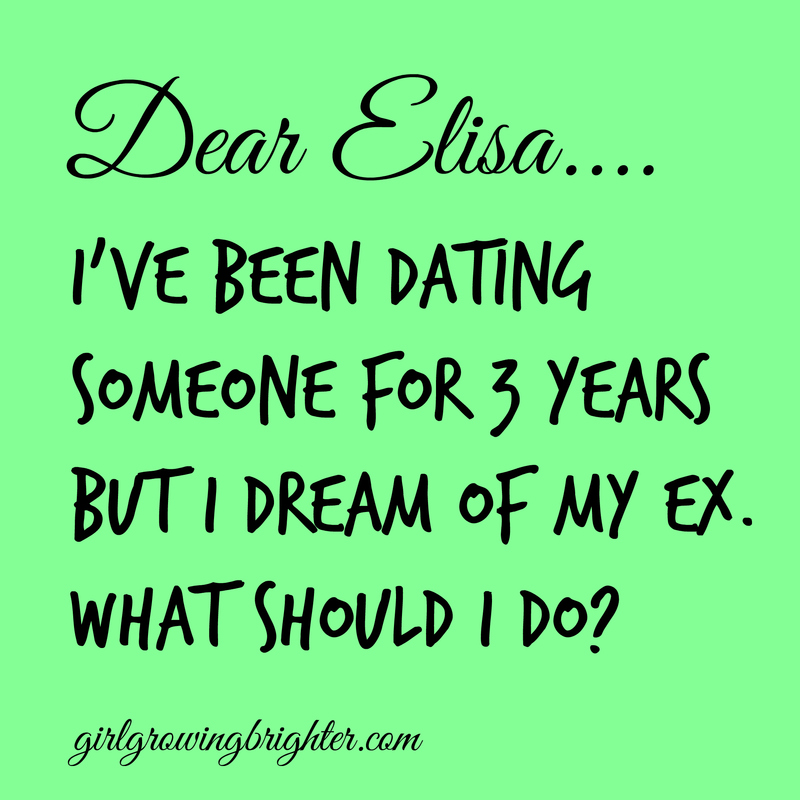 Dear Elisa: I’ve been dating someone for 3 years, but I dream of my ex. I’m not exactly sure what to say. I’ve been with my girlfriend, Kath, for almost 3 years now but I haven’t been completely honest with her. It’s been 5 years since I broke up with my ex-girlfriend May Ann, yet I still love her and miss her so much. …..I didn’t really treat her that well. I was young, I was possessive of her, I got jealous so easily and end up pushing her away. By the time I realized my mistakes, it was too late. She was already happy with someone else. I am cleaning out my house for a major life change, and flipped through a large stash of mail. 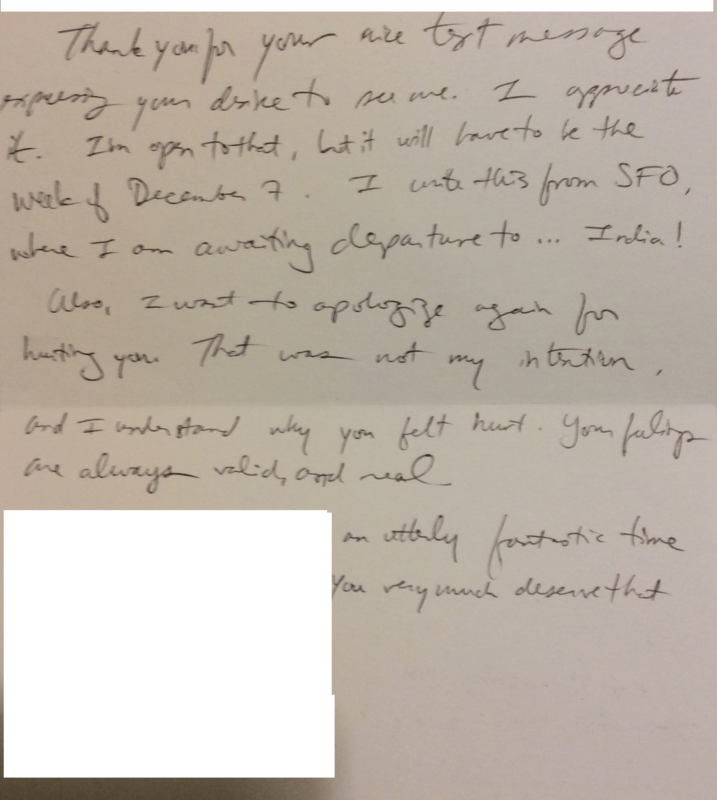 Magically, I stumbled across this piece of work, aka: one of the most grandiose, non-apology letters I’ve ever gotten. Note it is on paper. It was delivered courtesy of US Post Office. Though I won’t reveal which year this was written, it was sent in the last 10 years of the 21st century: an era in which people send text messages, emails, and make phone calls (not send paper letters), as evidenced by that first sentence (“thank you for your text message expressing your desire to see me”). What I love about this non-apology is that it is completely couched in positive-sounding words. It’s beautiful in that regard. So, without further ado…. let’s learn from the best and learn how to write the “fake apology”! Part 1: Avoid proactively repairing the relationship. Be passive so as to avoid the situation. You woke up before your alarm clock rang, wondering what to do. You researched the answers on the internet until the sun rose. You relentlessly asked your friends. Or maybe you stared at the ceiling every night, hoping that your god, your ancestors, or a UFO, would send you an answer. Finally, you made a choice. I mean…. you had to. So how do you know if your choice was the “RIGHT” one? Take a step back and look at your own body and recent actions. Your body knows the answer, often before your mind does! Here are 5 signs that you have made the right decision. 1. You will feel relief. You will feel inner freedom. Wait….WTF does inner freedom feel like? It feels a little like this, above. But on the inside. Here’s how your body will tell you: Take a breath. Do you feel like your lungs are squeezed together with iron bands?